Gardening is an activity enjoyed by millions around the world. While some are passionate about gardening and has made this into a professional career for themselves, others enjoy maintaining a garden on their own property, and we all know that the best weed sprayer plays a vital role in your garden. Whether your garden is big or small, some basic principles stand for all types of gardens. This includes regular maintenance with fertilizing agents, as well as appropriate coverage with agents that help to keep unwanted vegetation and bugs at bay. With many different garden sprayers out there on the market, you may find it somewhat challenging to make the right choice. There are different brands and different models, each with features that can seem a little overwhelming, especially if you are still relatively new to gardening. To make things much easier for you, we have decided to take a look at some of the best garden sprayers that you can find on the market today. After reviewing many of these options, we have compiled a list of the 10 best garden sprayers that gives you the best value for your dollar. 1 What Are Garden Sprayers And Why Are They So Important? What Are Garden Sprayers And Why Are They So Important? Garden sprayers are relatively simple tools, yet play an essential role in the maintenance of a garden. Whether maintaining a large garden or a smaller, simpler garden with only a few flowers or vegetables, the use of a garden sprayer becomes essential in all situations. A garden sprayer is mostly a tank that is connected to a hose, with a nozzle attached to the end of the hose. The tank is filled with a liquid-based substance that is sprayed through the hose and nozzle. There are many different uses for a garden sprayer. One of the most popular uses for these devices is to spray fertilizer over plants, which helps to promote the growth of these plants. Both herbicide agents and pesticide agents can also be added to the tank to provide adequate protection for the plants against pests and insects, as well as to keep unwanted weed species to grow in the garden. Different types of these devices are available on the market today. While traditional garden sprayers that are manually pumped and operated still remains a particularly popular option, newer modules include battery-operated electronic features that take away the need for manual pumping. Many people are switching to electronically operated garden sprayers today, but some people still find specific benefits offered by the traditional options more suitable toward their preferences and needs. The market is flooded with thousands of different garden sprayers to choose from today. No longer can you enter a store and have the choice to choose between two or three different models. There are specific benefits to the larger variety of choices that you are presented with but, at the same time, this can also be very overwhelming. Certain factors can be used to help you make the decision of choosing the best-suited garden sprayer for your needs easier and faster. One of the first factors that should be accounted for is the type of garden sprayer you wish to buy. You will need to decide whether you want to opt for a traditional option or rather take advantage of the featured offered by electronic garden sprayers. Additionally, you will need to decide if you want a backpack sprayer, a portable sprayer or a larger option that comes with extra storage space for the liquids you wish to spray in your garden. While browsing through the selection of options available, you should take specific features of each device you might be interested in into account. Manufacturer / Brand – The manufacturer of the garden sprayer you want to buy plays a big role in providing you with an overview of the quality featured by the device. Some brands are known to produce higher quality products than others. Ideally, you should look for a brand that can provide you with a top-quality garden sprayer, while still fitting into your budget. Size of the device – The overall size of the garden sprayer should also be a factor in your decision-making process. Do not only consider the capacity of the tank, but also the size of the overall device. You want to make sure that the tank can hold an adequate amount of fertilizer, herbicide or pesticide agents, without being too large to carry or push around on your property. 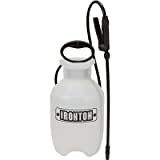 Portability – Since you will be moving the garden sprayer around often, you should also look at its portability. If you have a relatively small garden, then the mobility of the device may not play as big of a role as compared to a larger garden. Many of these devices come with straps that allow you to carry them around easily. Some are also small enough to carry in a single hand. Durability – You obviously do not want to buy a new sprayer every time you need to work in your garden. Always look at the durability of a device before making a final decision. It is usually difficult to determine the durability of a sprayer, which is why taking a closer look at the review section can help you decide if customers are happy or finding that the device fails to work after just a few uses. Whether you are looking for a hand sprayer or one that you can carry on your back, there are options on the market to suit the needs and preferences of every shopper. We have taken a look at the various devices that are available to bring you the top 10 options that you can buy to gain the absolute best value for your money. TOur top choice for any person looking to buy a portable and affordable garden sprayer is the Chapin 2000 1-Gallon Poly Garden Sprayer. This is most likely one of the most affordable options that you will currently find on the market. The sprayer offers many useful features that make it an ideal choice for spraying herbicides, pesticides and fertilizers in your garden. The device features a manual pumping system, which makes it suitable for individuals who do not constantly want to be faced with the hassle of having to recharge batteries before they can use their garden sprayer. A one-gallon tank means an adequate supply of liquid agents can be added to the device to cover a relatively large area of your garden at a time. 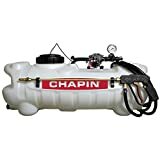 The Chapin 2000 1-Gallon Poly Garden Sprayer features an easy-filling option that makes it quick and convenient to refill the tank once all liquid has been used up. It is also incredibly easy to clean the tank, which makes it easy to switch from one agent to another, such as when switching from an insecticide sprayer to a fertilizer sprayer. The tank also features a built-in filter, and the handle makes the task of manual pumping a breeze. Another excellent option for people who are in need of a garden sprayer that will not cost them a significant amount of money. This device is manufactured by a trusted brand in the gardening industry, Tabor Tools, and comes with convenient features that make it an ideal solution in many scenarios. The Tabor Tools N-50 1.3 Gallon Garden Pump Pressure Sprayer is a manually-operated device, which means there are no batteries that need to be recharged prior to the use of the device. It is the perfect solution for spraying a variety of agents in your garden, such as fertilizers, pesticides, and herbicides. The device comes with a built-in tank that is large enough to carry an adequate supply of liquid agents to cover a large patch of lawn or a large area of your garden. In addition to these features, the Tabor Tools N-50 1.3 Gallon Garden Pump Pressure Sprayer also comes with a built-in shoulder strap. This makes it more convenient to carry the device around your garden, especially if you are planning to spray your lawn – in which case, having to carry a sprayer by hand all the time can become quite tiring. For those who take their garden spraying operations more seriously, the Field King Professional 190328 might be an ideal solution. Even though somewhat pricier than the other options we have mentioned thus far, this option provides a sturdier overall build, combined with a no-leak design that ensures all the agents contained in the tank stays in the tank. The device is also perfect for a variety of liquid agents to ensure you can use it for multiple operations – whether you wish to fertilize your crop or spray insecticides to help keep bugs and other unwanted insects away from your precious garden. The Field King Professional 190328 comes with a four-gallon tank, which is much larger than many other options in its price class, considering the overall quality of this device. The device has a build in a system that allows for easy mounting on your back, which means there is no need to carry the sprayer with you around the garden while spraying. A brass component is also used for the shut-off feature to ensure you can easily stop the flow of liquids in an instant. While not as powerful as an electric sprayer, the Konnig 1.3-Gallon Pump Action Garden Pressure Sprayer surely has an adequate number of features to meet the requirements of even the strictest of gardeners. This device features a premium-quality overall design with safety features in check that ensures the internal contents of the tank does not leak out. The device is a perfect option for any type of liquid agents that needs to be used in your garden and even comes with a free pair of garden gloves, ensuring you can keep your hands clean and safe during the time spent gardening. The wand features a high-quality design with an adjustable nozzle, which can be set from mist toward a more powerful spraying option. The shut-off trigger also ensures the flow of liquids can be halted quickly in case of an emergency. The device features an easy to clean the tank and several markers on the tank that is useful when it comes to mixing different liquid agents. 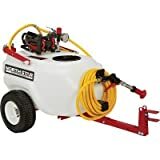 If you are looking for the best weed killer sprayer that will fit a relatively small budget, then consider looking at the Smith Contractor 190216 2-Gallon Sprayer. A relatively basic device that comes at a very affordable price, as well as with all the features you will need to spray a variety of liquid agents on your lawn, as well as in your garden. This sprayer is versatile as compared to many other options, as its tank has been built not only for gardening purposes but also for other uses – the device can also be useful for cleaning and sanitizing environments inside and outside of the house. The tank came with a built-in filter and was made with ease-of-use in mind. Cleaning is quick and easy, and switching between different liquid agents become more convenient with the use of the Smith Contractor 190216 2-Gallon Sprayer. The device comes with five different nozzles, including an adjustable fan nozzle, for maximum versatility during your operations in the garden. While most certainly not the ideal solution for anyone looking to buy a yard sprayer, the Solo 418 One-Hand Pressure Sprayer is one of the best garden sprayers that you will find if you manage a small garden. This tool is a one-handed device that features maximum portability, along with premium-grade design features. In addition to providing all the standard features you would expect of a sprayer, the Solo 418 One-Hand Pressure Sprayer also comes with seals that have been developed to be chemical-resistance, making the device perfect for use with certain harsh chemicals – without causing leakages or any other problems. The nozzle has been designed to feature multi-directional spraying option, with adjustable features that make it very easy to adjust the flow rate of the liquid agents. A pressure release valve also makes it easy to quickly release any excessive amounts of pressure that might have built up in the tank. The VSE Garden Sprayer On Wheels is probably the best electric tank sprayer on the market if you are looking for a device that you do not have to carry around on your back or shoulders. This device comes with a fully featured electrical unit that eliminates the need for any manual pumping. The device features two built-in wheels, which makes it incredibly easy to push or pull the device around your garden. The VSE Garden Sprayer On Wheels is an ideal solution for different operations and for gardens of all sizes. The VSE Garden Sprayer On Wheels comes with a five-gallon tank and can spray as much as one gallon each minute. A single charge provides for up to eight full tanks of usage before further charging is needed. The device is fully weatherproof and comes with a heavy-duty wiring system to protect the device against external hazards. The NorthStar ATV Broadcast And Spot Sprayer is a commercial-grade sprayer that provides a higher level of performance as compared to most other options that you will find on the market. This device is most certainly not the ideal solution for smaller gardens but will suit your every need if you have a larger garden to maintain. The device features a built-in 12-volt battery that can be easily recharged and provides a much more significant operation time per charge. The NorthStar ATV Broadcast And Spot Sprayer come with a 15-gallon tank, which makes this device capable of carrying quite a large amount of liquid agents. This ensures you can spray a larger area without the need to refill the tank constantly. The device has a max PSI setting of 70, which can be adjusted based on the flow required flow strength. Another commercial-grade option from the NorthStar brand. This device features a larger tank capacity and can be used for a variety of different chemical solutions, including the harsher kinds of options available to assist with keeping weeds and insects away from crops. The device is an ideal solution for a very large garden and lawn and comes with a 12-volt internal battery that can be easily recharged and provides enough power on a single charge to cover your lawn. A 21-gallon tank means you will be able to fill the device up with enough liquid agents to ensure you will most likely not need to do another refill during your operation. The specially designed pump also ensures better durability, which ultimately leads to a longer lifespan and better value for the money you spend. Whether you are looking for the best lawn sprayer or a portable garden sprayer, one thing is for sure – fertilizers, insecticides, and herbicides are all essential to the wellbeing of your garden. If you find it difficult to choose the best option on the market for your garden, then be sure to take a closer look at what we have shared in this review guide. We analyzed different garden sprayer models to bring you the ones that offer the perfect balance between affordability, features, and durability. It is an Egg-Citing Affair!